September 11th is fast approaching. 10 years…Holy Crap. I recall exactly the moment, much like most of you, I saw the live coverage of the Trade Centre attacks. I was working at a physio clinic in Victoria, BC, and sat down with my morning coffee in my living room to watch the news on Channel 13. It goes without saying that it was big news! 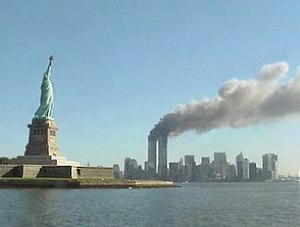 I have found the September 11th tragedy to be the most fascinating world event. I wasn’t around for the landing on the moon. I vaguely recalled Elvis dying, John Lennon getting shot, the Ronald Reagan’s assassination attempt. None of them hold a candle to it. Even after 10 years, the story grips me. I am torn between the feeling of great loss, getting wrapped up in conspiracy theories, and watching the post September 11th loss of our personal freedoms in the name of security. Much like seniors that talk about how the world wars changed them forever, I and most of my generation will tell the same story to our grand-kids. There is not much commentary that I can add to make the story better/worse or more interesting. What I like to hear is other people’s memories of that day. Where they were when they found out? What they originally thought or felt? It is like this moment in history where I can know exactly what other people were doing at the exact time I can remember what I was doing. It’s like freezing time. If that makes sense? So, please leave me a comment as to what you were doing on that day? And any other thoughts you have about it. I was watching a Japanese comedy show in my tatami mat room in Kyoto. The tatami mats were still new, I remember the smell. There was an emergency broadcast and all channels flipped to cover the story immediately. I stayed up nearly all night watching, and ended up paying for a subscription for English news channels on my satellite connection (CNN/BBC/etc). The scary thing is I know people who lost people in that tragedy. It’s amazing how truly small the world feels after an event like that. How did I feel? Shocked. Couldn’t tear my eyes from the tv. And after seeing the footage of people dancing and celebrating in the streets in certain parts of the world, I felt incredulous and furious at the same time. Previous PostPrevious Postaday2011 Challenge. 8 months down, 4 to go!